Much like Street Fighter IV, Super Street Fighter IV features 3D backgrounds and characters played on a 2D plane. Exclusive additions like “Focus Attacks” and separate meters for both “Super” and “Ultra” combos make a return. The “Ultra Combo” gauge and moves has been left unchanged since Street Fighter IV but players will be able to choose between two Ultra Combos available for both existing and new characters. The goal is to exhaust the opponent’s health meter before the time runs out. The player wins a round if they deplete their opponent’s health meter, or have more health than their opponent when time runs out. If both players deplete their meters at the same time or contain the same amount when the round timer ends, it will result in either a “double KO” or a draw giving both players a round win. If there isn’t a clear winner by the final match, it will result in a “draw game” (during online play, both players will lose battle points,and player points, in the result of a draw game). Similar to past entries, Super Street Fighter IV is played using an eight-way directional system giving players the ability to jump, crouch, and move towards and away from opponents. Generally there are six attack buttons for both punch and kick commands with three from each category differing in strength and speed. Similar to the latter two games from the Street Fighter III series, players can perform grabs and “personal actions” by simultaneously pressing the light and heavy punch and kick buttons respectively. When playing through the single-player mode, if toggled on, there are additional “bonus stages” allowing a chance to receive additional points, similar to the ones found in Street Fighter II. The first challenge involves breaking a car while the second has players break as many barrels as they can. It’s not too often to see a fighting game steal the spotlight for a system’s launch, but that’s exactly what Super Street Fighter IV 3D Edition does on Nintendo 3DS. Between keeping true to the original game and finding a way to become more accessible than ever, Super Street Fighter is not only one of the best 3DS games at launch, but one of the few fighting games I’d genuinely recommend to anyone. Just keep in mind some sacrifices had to be made to get this in portable form. By and large, Super Street Fighter IV leaps to the Nintendo 3DS intact. All 35 fighters from the console versions have been brought over, including characters that were added later on. Variable costumes and colors are also included, giving players a very robust cast of characters from the start – don’t expect to unlock anyone as you play. In terms of its core concept, Super Street Fighter is exactly what you’d expect – pick your character and face off against your opponent. 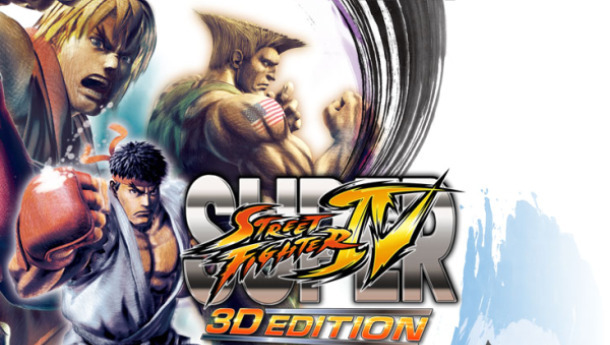 Super Street Fighter IV: 3D Edition is more than just a simple port of the venerable fighting franchise. Several aspects of the game have been carefully tweaked to fit within the smaller confines of the 3DS, resulting in a fighting experience that feels every bit as impressive as its console cousins. Combat is fast, fluid, and visually spectacular and is as deep as it has ever been, making this one of the most technically brilliant fighters to have ever graced a handheld. There are some glaring omissions, though, such as leaderboards and an online tournament mode. Some compromises have also been made to accommodate the 3DS’s button layout, but these are largely offset by a customisable touch-screen interface that makes the game more accessible than ever to newcomers. Judging the portable version of any arcade fighting game is difficult for a couple of reasons. While it’s possible to translate the visuals (see Street Fighter Alpha 3 Max, Tekken Dark Resurrection, and SoulCalibur Broken Destiny — all on PSP), the portable hardware they’re played on can feel confining, like it’s missing something. And Street Fighter IV: 3D Edition, the first 3DS entry in the venerable fighting franchise, still suffers from this problem. The game captures the essence of its console siblings remarkably well (even in 3D), and it’s packed with a feature set that’s impressive for a portable game. However, minor flaws still make it feel like the game’s been shoe-horned onto the platform.